NDP Health Critic France Gelinas with OPSEU’s Sara Labelle. The organizers had to put out more chairs as the audience filled the small room in the Oshawa Seniors Centre. Upstairs they were playing Bingo, downstairs about 50 people came to talk about their frustrations with a health care system that is failing them. NDP Health critic France Gelinas said there was a silver lining to the proroguing of the provincial parliament – it was an opportunity for her to get out and talk to citizens across Ontario about the care they are receiving. Gelinas was part of a panel of three this night: OPSEU’s Sara Labelle and the Ontario Health Coalition’s Natalie Mehra rounded out the bill. 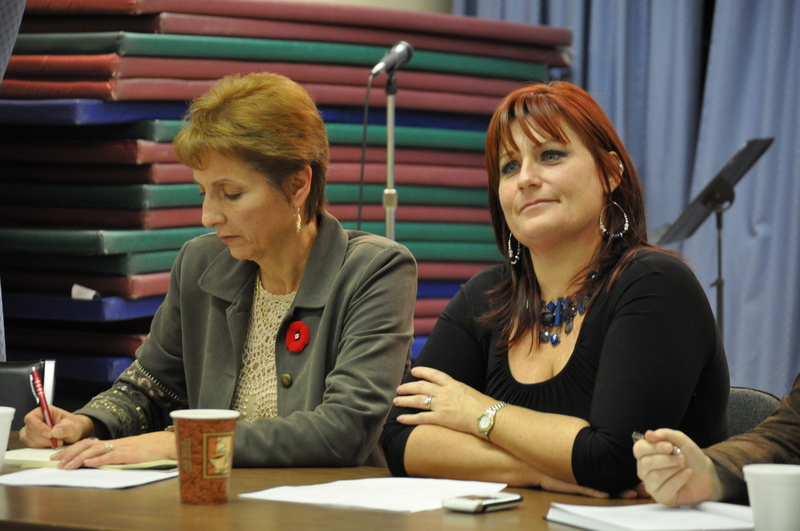 An Oshawa civic politician, Amy England, did the facilitation. But most of the talking this evening would come from the audience, not the front of the room. The owner of a supportive housing facility railed against a forced merger by the Local Health Integration Network. Another complained about having to leave a crowded ER at Lakeridge Health because the noise was “like a rock concert.” He wanted to know what the statistics were on people who left the ER against medical advice. One of the event organizers told the heartbreaking story of her lengthy struggle to reunite her elderly parents in the same long-term care facility. “This is cruel – there is no reason for this,” Gelinas said. The NDP Health Critic said she had been pushing hard to make reuniting couples a priority, and that long-term care homes now have to comply with a ministry directive to do so. She asked that the speaker come see her after the event. One former hospital worker spoke of professional staffing shortages that have effectively meant that cleaning staff become the front line contact, not nurses. A CAW retiree spoke of how he had to pay out-of-pocket for expensive medications to slow down the loss of his eye sight, but complained that only when he lost his sight would he get full OHIP coverage. He wondered where the sense was in not putting the funding in prevention first? Gelinas said that health care was changing and drugs were becoming more central in treatment. It was time to expand Medicare to include Pharmacare. An elderly gentlemen spoke of spending 10 hours with an ambulance paramedic in the ER because staff was insufficient to transfer care. He said six other ambulance attendants also waited the same day, calling into question the cost of stranding emergency response so long at the hospital. You can’t attend one of these meetings without hearing about hospital parking. A member of the local health coalition complained his pre-arranged appointment with a specialist was four hours late, running up the bill in the hospital parking lot. He questioned the logic of the city placing ‘no parking’ signs all around the adjacent neighborhoods to allow Lakeridge Health to maintain its expensive parking monopoly. Parking fees at Lakeridge are well beyond the cost of parking anywhere else in the city. An Oshawa city counsellor said he wanted to put parking meters in nearby Alexandra Park to provide alternate and more reasonably priced parking. With all the frustration over the lack of alternate community services, Sara Labelle told of her early life in a remote area of Brazil. Her family was given a handbook called “Where There Is No Doctor.” You might say it is the ultimate self-care option. The question is, are we headed towards that in wealthy Ontario? We noted that neither Lakeridge Health or the Central East LHIN sent anyone to the evening meeting. To be fair, Lakeridge Health CEO Kevin Empey did meet with Gelinas earlier in the day, and Empey has been visible at other community meetings. While it would be impossible for the LHIN to send someone to all of these community organized meetings – especially with a five per cent cut in funding this year — the problem is we find they don’t send anyone to any of these more organic meetings. Consultation always seems to be on their terms, and yet it is not unusual to hear about formal stakeholder consultations where very few community members ever show up. The common complaint we hear from community members is the LHIN didn’t want to hear what they wanted to talk about. Tonight there was a full room and an opportunity lost to engage. 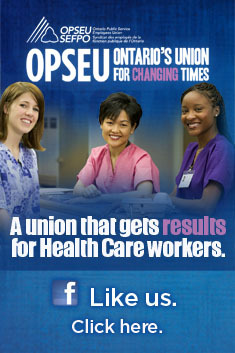 The only cost would be a few hours of LHIN staff or board time. If nothing else, attending such organic meetings would be a counterpoint to the rosey hospital and community provider presentations the LHIN boards regularly sit through. After spending three days at OHA HealthAchieve hearing about how great our hospitals are, this was a reminder for us about the reality on the ground. We thought the LHIN might feel the same. This is not the first time we have raised this issue. In the spring we organized two meetings of mental health professionals – one in London, one in Thunder Bay. The plan was we were going to let the unionized care providers speak first in a process we would facilitate, then the LHIN would have the opportunity to comment or ask questions at the end. The Southwest LHIN didn’t reply to our invitation. When we contacted them on the day of the meeting, they simply gave us the brush off and told us no one was available. It was a great meeting. Pity they missed it. The Northwest LHIN did see the invitation from us as an opportunity, and sent two people to an engaging meeting in which they filled up notebooks from the constructive comments made by front line workers. They heard about how the hub of the system had been lost in Thunder Bay. They heard about the impact of poor housing for their clients. They heard about the lack of resources where they were critically needed. The LHIN representatives said they wanted to invite these workers back again in the fall to do this over again, but at a meeting they call. Only once can we recall a grass-roots community organized event where someone from the LHIN actually showed up. It was during a demonstration outside Hamilton Health Sciences over proposed changes to the ER. At one point someone from the stage asked whether anyone from the LHIN was present. A hand went up. It was Stephen Birch, a McMaster professor and board member from the Hamilton Niagara Haldimand Brant LHIN. Shortly after the event Birch resigned his seat on the LHIN board. Here’s a message to the LHINs: please come out and listen to what our communities want to tell you, not what you want to hear from them. Not only will it help your sagging reputation in these communities, but we won’t make you resign afterwards. We promise. As a postscript to this story, we did hear from the Central East LHIN who said they would have liked an invite to the Oshawa meeting. They acknowledged that they too have heard stories similar to those told in this story. We are not aware of whether the organizers extended an invitation or not (an OPSEU leader was on the panel, but it was not an OPSEU event). The reality is there are organic community-organized forums for health care happening all the time. We get more notices than we can possibly attend, and since this BLOG began, that activity has escalated even further. We couldn’t expect the LHINs to attend all of these events no more than we can. Everybody’s resources are limited. However, they don’t necessarily need an invitation to an open event either. If the LHIN is really linking with community stakeholders, then they should be aware of such events taking place. It’s not hard. It is also an apt reminder that if we truly want to have a dialogue with an organization that has some ability to make change, then sending at least a notice, if not an invitation, to the LHIN is not a bad idea either. During the meeting one audience participant said he had heard enough horror stories and wanted to know what we are going to do about it? That might have been an apt time for that dialogue to begin. This entry was posted in Uncategorized and tagged Amy England, France Gelinas, Kevin Empey, LHINs community engagement, NDP Health Critic, Oshawa Health Coalition, Oshawa Seniors Centre, Sara Labelle. Bookmark the permalink.